The Montana Nap is super plush and provides sensibly stylish slumber no matter where pets call home. The density of the fabric means more loft and cushion—which means better comfort and durability. Plus, it's made of eco-friendly, recycled materials and designed to last against doggy damage. Dimensions: Extra Small: 20" x 15" x 2"; Small: 24" x 18" x 2"; Medium: 29" x 20" x 3"; Large: 35" x 22" x 3"; Extra Large: 42" x 27" x 3"
Weight: XS: 0.7 lb. ; S: 1.034 lbs. ; Medium: 1.53 lbs. ; Large: 1.891 lbs. ; Extra Large: 2.794 lbs. My dog sleeps on this next to our bed. He absolutely loves it and is so comfortable. This is probably the best pet mat my cats have ever had. They took to it without any hesitation and it has become their favorite. Based in Bozeman, Montana, West Paw Design makes dog beds with pets, convenience, and the greater good in mind. With its sewn in cushion and comfortable raised edge, the Montana Nap is so soft that it’s hard to believe it contains 61% Intelliloft, a durable, eco-friendly fill made of recycled plastic bottles fiber batting. Available in a variety of colors and patterns, each mat is handmade in the USA. Unlike other bulky, two piece dog beds that contain inserts that are not machine washable, the Nature Nap’s unique lightweight one piece design makes it easy to throw the whole mat right in your washing machine. And, it dries in no time. 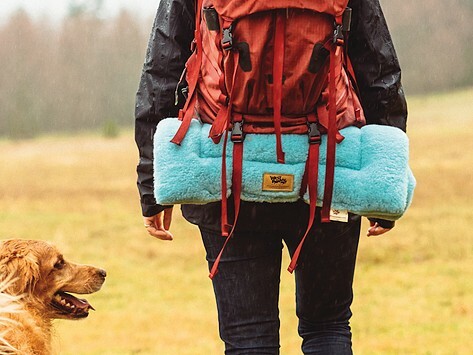 Perfect for travel, in the base of a dog crate, or just for lounging around the house, the Montana Nap is a dog bed that’s as dreamy to put paws on as it is to clean.